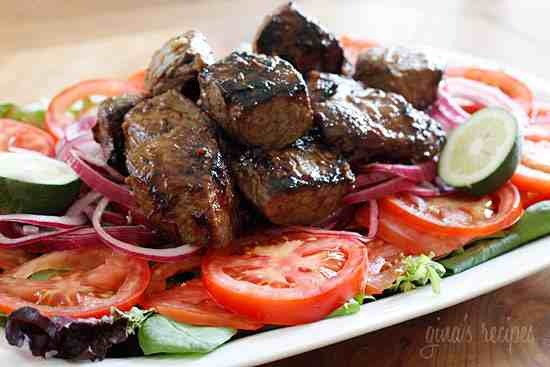 Marinate steak at least 1 hour before cooking, or overnight for best results. Combine garlic, oyster sauce, agave or sugar, fish sauce, soy sauce and sesame oil with the beef. For the vinaigrette combine rice vinegar with salt and sugar. It should be a balance of sour, salty and sweet. Thinly slice the red onion and use about 1/4 cup of the vinaigrette to pickle and set aside covered in fridge for about 10 minutes. Prepare bed of greens and tomatoes in a serving platter and set aside. Make dipping sauce by squeezing lime juice over salt and pepper in a small ramekin. Heat a large wok or pan over high heat. When very hot add 1/2 tbsp oil and when it begins to smoke, add an even layer of beef (half) and allow to sear for about 2 minutes, before ï¿½shakingï¿½ to sear the opposite sides for about another 1-2 minute more to brown all the sides. Repeat this with the second batch of meat using the remainder of the oil. Transfer beef to bed of watercress and tomatoes. Drizzle remainder of the vinaigrette over the beef and greens and top with pickled red onions. Serve with lime dipping sauce.